Hand Circumference: 6.5 (7, 8, 9) inches, 16.5, (18, 20, 23) cm. Please note, if you have purchased the matching Woodland Hat separately, you can get the Woodland Mittens at a discounted price of $4.50 CAD (which makes the total the same price as the e-book!) Discount should be automatic with the ‘Buy Now’ button. The original inspiration for Woodland Mittens was the Woodland Hat, which I designed a few years ago for the Ravelry Designer’s Challenge, based on a woodland theme. This stitch pattern brought to my mind the image of moss in the knots of trees, with it’s double-moss stitch enclosed within the cable sections. 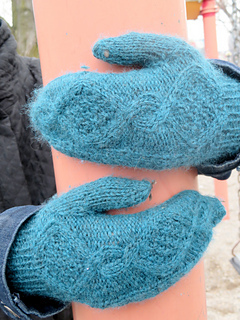 I thought that the stitch pattern also would work well for a pair of mittens, and so, these mittens were born! 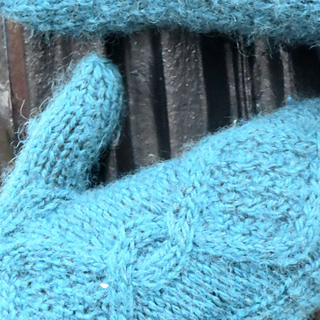 The mittens are knit from the 1 by 1 ribbed cuff up and the thumb is done with a side-seam thumb gusset. 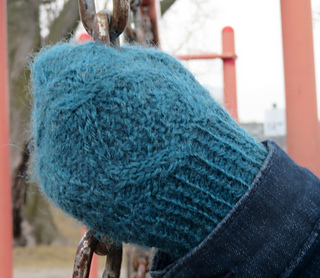 The cable motif continues through the top decreases of the mitten. The sample was knit in Baa Ram Ewe’s Dovestone DK, which is a DK-weight blend of several different breeds of sheep’s wool. If you’re substituting yarns, I’d suggest something with a mostly wool content, with at last 50% Bluefaced Leicester (BFL) if possible.You could use a sport-weight yarn in substitution, but I’d suggest a DK-weight if possible. Please bear in mind that the two larger sizes may require two skeins of recommended yarn, depending on your exact gauge. For questions and support, please visit this thread in my Ravelry Group, e-mail me at sarahdawnsdesigns@gmail.com, or send me a PM here on Ravelry. This pattern has written instructions, and the stitch pattern is both written and charted. Please also note, that due to the nature of PDF downloads, I am unable to offer refunds. However, I am available by e-mail, here on Ravelry, or on Facebook to answer any questions/concerns you may have. Also, please note that depending on your location, taxes or VAT may be added to your purchase price. You may not re-distribute this PDF. While you may teach a knitting class using this pattern, each student in the class must purchase a copy. However, if you would like to purchase discounted copies of the pattern in bulk for a class, please, contact me for details. donations to charity, go right ahead. If you want to sell anything you’ve created from this design for charity or commercial purposes, also go right ahead. The only thing I ask for the above is that you credit me (“Sarah Dawn’s Designs”) and list the pattern name as well. Thank you! If you would like to offer to translate this pattern into other languages, I’d love to work with you to do so! Please, contact me (either by e-mail or here on Ravelry), to discuss the details. If you would like to try this pattern from Sarah Dawn’s Designs for free, you can sign up for the Sarah Dawn’s Designs E-mail Newsletter and a Free Pattern Download here. Also, Sarah Dawn’s Designs is now on Patreon! For access to exclusive behind-the-scenes content, discounts, input on designs, live-chats, and more, please come join in!